Whether she’s teaching students about nutrition at Chico State or supporting North State families through the University’s Center for Healthy Communities (CHC), Stephanie Bianco is serious about the impact of her work. “We’re helping the students meet their basic needs so they have more time to study, so it decreases their stress level, so it helps increase their concentration because they’re no longer food insecure,” said Bianco, an associate professor in the Department of Nutrition and Food Science. If it’s an on-campus program designed to help students meet their basic needs, Bianco most likely played a role in getting it off the ground. From garden-enhanced nutrition education at underserved schools in the North State to staffing the Hungry Wildcat Food Pantry and conducting CalFresh Outreach (providing nutrition assistance for low-income individuals and families), Bianco’s knowledge, drive, compassion, and leadership have helped propel Chico State to become a model for the state—and earned her recognition from the CSU. Today, the Chancellor’s Office named her as one of 26 CSU faculty to be recognized with a Faculty Innovation Leadership Award for their commitment to student success. Bianco’s ideas and implementation has helped set the groundwork for life-changing programs at Chico State that are now being emulated across the CSU. 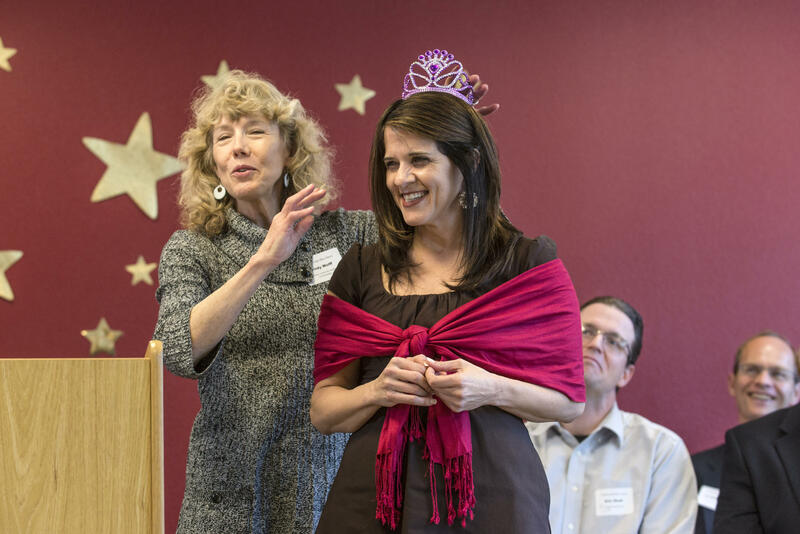 Cindy Wolff (left) honors Stephanie Bianco (right) at a February 2015 reception for the 2014-2015 Professional Achievement Honors, which highlight faculty who have exemplified the teacher-scholar model over the past three years. Cindy Wolff, executive director of the CHC, said when Bianco joined the team, she quickly helped to fill much-needed niches. “I’ve been a professor in the CSU and a community leader for over 30 years, and I have never met or worked with anyone more productive or dedicated to our students and to their continued success,” said CHC Executive Director Cindy Wolff. A faculty member since 2005, when Bianco joined the center’s team in 2006, she quickly helped fill high-demand niches. Bianco became assistant director in 2012 and associate director in 2014. The CHC has grown from one or two annual grants and program proposals to more than 30. Bianco writes the majority of them, conceives of most of them, and supports the CHC’s grant writing teams in every corner of the center’s sunlit office. Of all the grant and contract proposals Bianco writes each year, her latest achievement promises to be her most impactful yet: the expansion of the CalFresh Outreach contract to reach 20 CSU campuses, 4 University of California campuses, and 15 California community college campuses, as well as one private university. This expansion will directly impact tens of thousands of new students that experience high levels of food insecurity. And as the contract continues to grow, its impact could double—or even triple, Wolff said. According to the California Department of Social Services, the CHC is the first group in the nation to have a Higher Ed CalFresh Outreach Contract. Bianco has even been working with the University of Alabama, Montgomery, to model this work to support its poorest college students. CHC health education specialist Melissa Stearns has worked alongside Bianco since 2011. She describes her a beacon who genuinely cares about the organization and everyone who works there—and one who enthusiastically spreads that energy within her colleagues. Life experiences crafted Bianco’s personality and compassion. When she was 15, she worked at a food hub in Fresno, hand-writing checks for Hmong and Mexican laborers who harvested as many vegetables as they possibly could, which were then stored, packaged, and delivered to retailers. Bianco remembers those farmers were working indefatigably to support their families. When her parents couldn’t afford to pay her way to college at UC San Diego right out of high school, Bianco (the youngest of seven children) instead worked in Yosemite’s Ahwahnee Hotel for seven years. The valuable experience she gained there (working every job from the kitchen to the front of the house) she applies to her classroom. She eventually enrolled at UC Davis and made it through financially. But it wasn’t easy. 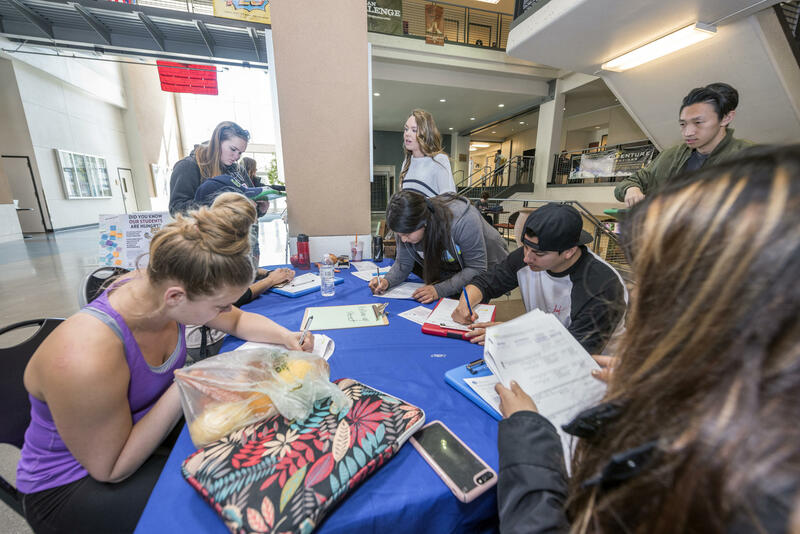 During CalFresh Day, students apply to receive CalFresh benefits, while more than 1,000 pounds of fresh produce was also given to students in a collaboration with the CalFresh Outreach Team from the Center for Healthy Communities and the Hungry Wildcat Food Pantry. Remembering her own food struggles, Bianco was determined to help the students in most need close to her. And to reach the thousands of Chico State students and North State residents that experience food insecurity, the Center needed help. That’s where an innovative student internship model Bianco provides oversight for, and one that’s now being used across the CSU system. CHC students (both paid and interns) help staff events, registrations, and programs the center holds thanks to the grants it receives. After the events finish, the experienced students move on to staff additional projects, and a new crop of students slide in to work the other events. Then the CHC applies for additional grants and needs more students. It’s an empowerment cycle with a positive impact on everyone it touches, and Bianco says the center doesn’t function without the interns. This model has become the state’s gold standard and is being repeated at most of the CSU campuses. The students she works with at the center are often in the classes she teaches (she teaches one class a semester, spending the rest of her time at the CHC). She loves the additional opportunity to engage with them and create connections between their coursework and the important work they are doing at the center. And as she continues to push and advocate for Chico State students and underserved North State communities, she returns to the purpose of her work.